Widely regarded amongst serious shooters as one of the best spring powered pistols that money can buy, the HW45 combines power and precision for a truly well rounded performance. 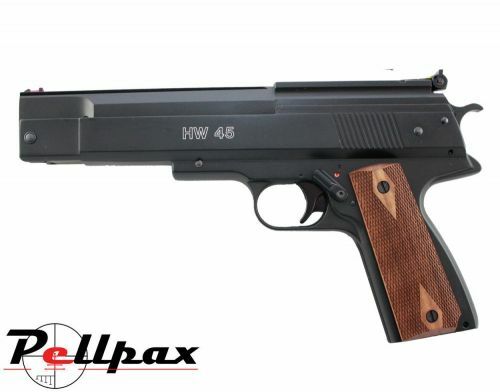 Producing around 5ft/lbs of muzzle energy, the HW45 is one of the few spring pistols that can be used for both target shooting and pest control. This high muzzle energy also equates to flatter trajectories and fired pellets being less susceptible to crosswind and other environmental conditions affecting their accuracy. The over lever cocking design of the HW45 is similar to that of Webley's range of pistols but is designed to resemble a Colt 45 for a much more attractive package. The ambidextrous safety and pistol grip make the 45 suitable for shooters of all kinds whilst the textured surface improves grip and precision. The HW45 also features a dovetail mount for the easy attachment of scopes, red dot sights or other external optics. Please note you will require the specialist 13mm Mounts to fit additional optics to this pistol.